In our quest for the ultimate happy hour, I have found a restaurant/bar that has got my attention. 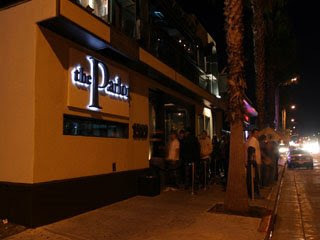 The Parlor in Santa Monica has over 50 LCD and Plasma TV's to give you the best view anywhere in the house. I'm impressed with happy hour being everyday from 4PM-8PM, unlike most happy hours that end at 7PM. The Parlor boasts $3 beers, $4 well drinks, and $5 house wines. Food is served until midnight. Yippee! Cheap drinks are also served on Sunday nights until 11pm. You will definitely catch me there this football season. 1519 Wilshire Blvd in Santa Monica. As always, click on the title link for more info. 50 TV's? Guess "he" won't be listening to my conversation. Finally a happy hour after 7pm! Now, I'm happy.